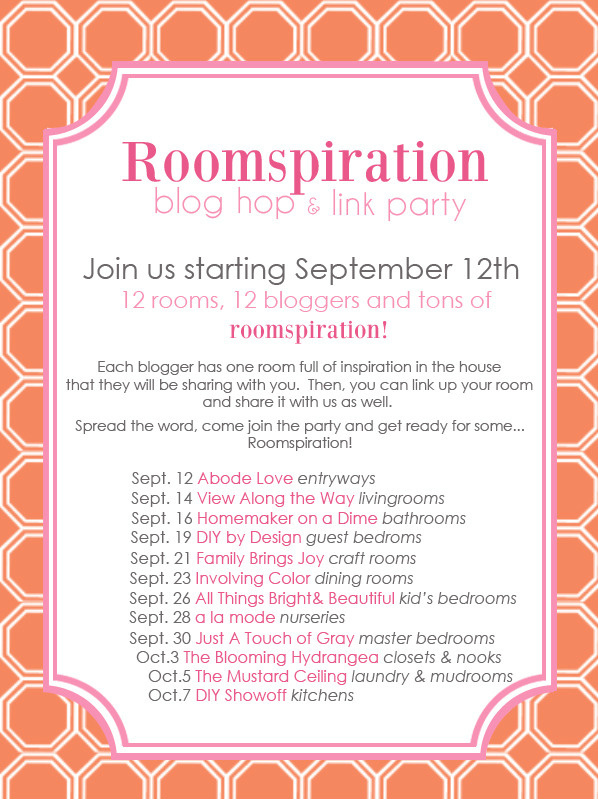 I've looked through my blog archives, and I've come to the conclusion that this guest room is the only room I have never shared on this blog. Well, here it is! In preparation for my best friend's arrival in two weeks, we have been working hard to upgrade this room. Back story: My best friend is moving back to Texas (!!) and she's going to live with us for a couple months while she looks for an apartment. This will be her room while she's here. This is not a room we created with a specific look or style in mind. This is budget-friendly room that evolved out of random things that were passed down, thrifted, on sale, etc. It is, however, the girly guest bedroom. When we bought the house, we decided that one guest bedroom would be more masculine (and would be Scott's dressing room when we weren't having guests) and the other would be more feminine. Check out the yellow and grey guest bedroom HERE. See that painting that looks oddly placed behind the bed? I did that back in college, and it's on four separate canvases. We used to have the bed in front of the window, so that painting was hung by itself on that wall (and actually made sense). We rearranged the room this weekend to give my friend more floor space, and all of the sudden that painting looks strange. That thing is a huge pain to hang up (as you can imagine, with four different canvases that have to match up perfectly). Scott: No way! I warned you when we hung it there that you better like it because I refuse to hang it ever again. I'm not moving it. As you can see, I lost that battle. I added the Texas star (every Texas home must have one) on the other side to balance it out, so I think it looks a little better now. Let me tell you, those crates we found at the thrift store are endlessly entertaining.You can play Tetris with them and arrange them in a million different ways. We ended up with this arrangement, which I love. I loaded it up with my own stuff for these photos, but it will be empty when my friend arrives so she can use it for storage. The room is full of my own artwork. The best part about my artwork? It's free! I customized this burlap piece for my friend to make the room feel like it was hers. I found this great quote on her Pinterest page, so I knew she would like it! It's a pretty simple project, and I'll walk you through the steps in tomorrow's post. When the guest is your best friend, you probably have a lot of pictures with them laying around. I took some old pictures of us and placed them around the room. Who doesn't like looking at pictures of yourself at the 8th grade dance?! We already had this sports corner with my jersey and some of Scott's football stuff hanging up, so we left it the same and added the photo collage (a gift from Scott's mom, from Pier 1). Another important update? Getting rid of the ugly, dated brass ceiling fan and installing an affordable brushed nickel version in its place. The colors tie in nicely with the brown curtains and silver curtain rod. We're officially ready for our guest! 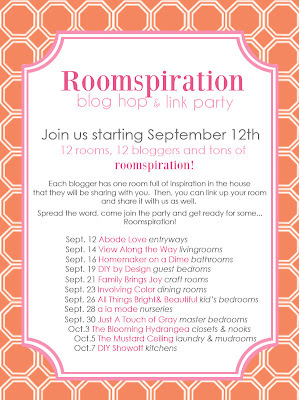 I'm sharing this room today at the Roomspiration Guest Rooms linky party. Come join the fun!